Image captured on 28 January 2019, by the VIIRS instrument, on board the joint NASA/NOAA Suomi-NPP satellite. 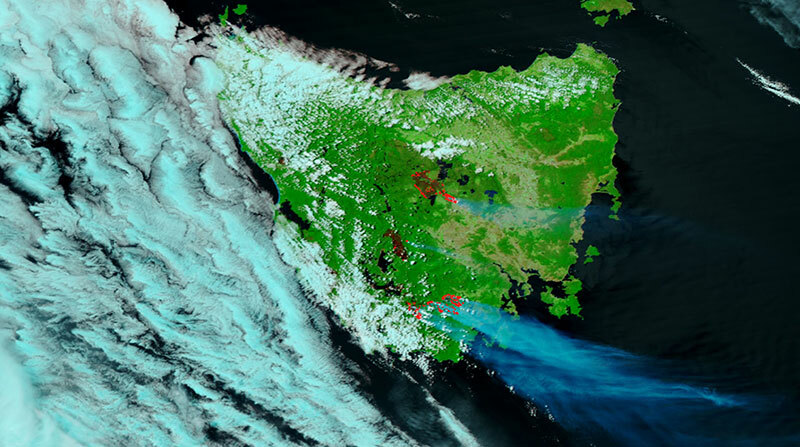 False color image of fires in Tasmania, Australia, acquired on 28 January 2019 by the Visible Infrared Imaging Suite (VIIRS) instrument, on board the joint NASA/NOAA Suomi National Polar-orbiting Partnership (Suomi-NPP) satellite. This false color image using VIIRS bands M11-I2-I1 is useful for distinguishing burn scars. The red dots indicate active fires at the time of the satellite overpass, and the previously burned areas are in a reddish-brown. Use the comparison tool to view the difference between the landscapes on 15 January and 28 January.